HRBFYF-101 | Size: 50 ml / 1.69 fl.oz. helps healing sun damaged skin. Thanks to their hygroscopic properties offered by the Konjak powder, the spheres volume grow rapidly, about 10 times over, which leads to filling and smoothing the wrinkles while increasing the elasticity and hydration of the skin for a long time. The effective formula of the cream is enriched with Borage, Sesame and Avocado oils with regenerative, restorative, antioxidant, emollient and moisturizing role. Usage: Apply AM and/or PM, massaging gently with circular movements to help the cream's better absorption. Focuse on the forehead, eyelids, the area around the lips, cheeks and neck. 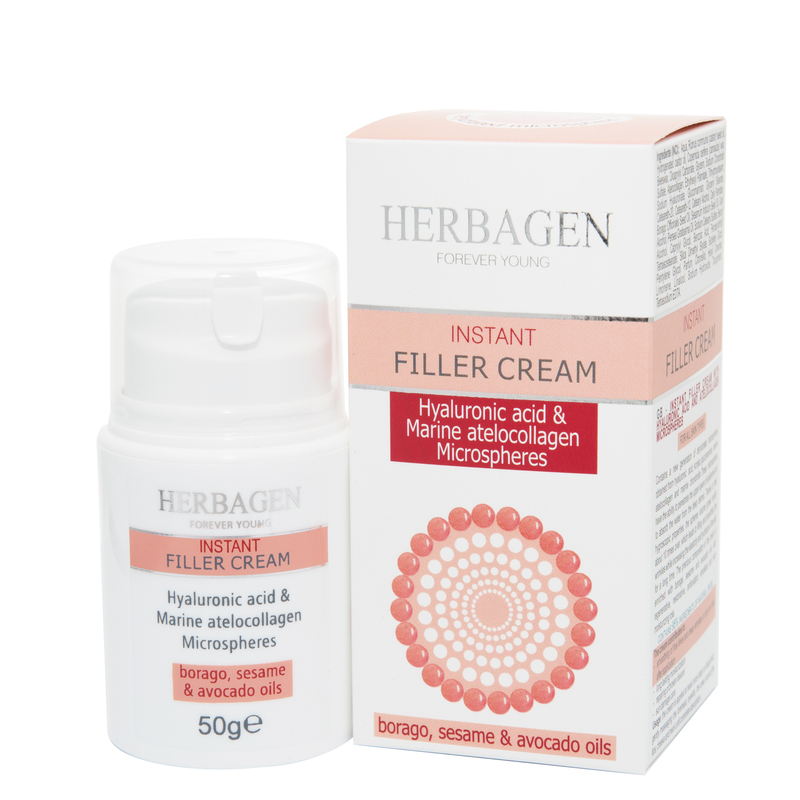 Apply AM and/or PM, massaging gently with circular movements to help the cream's better absorption. Focuse on the forehead, eyelids, the area around the lips, cheeks and neck. INGREDIENTS: AQUA, RICINUS COMMUNIS (CASTOR) SEED OIL, HYDROGENATED CASTOR OIL, COPERNICIA CERIFERA (CARNAUBA) WAX, BEESWAX, DICAPRYLYL CARBONATE, GLYCERIN, SODIUM CHONDROITIN SULFATE, ATELOCOLLAGEN, ETHYLHEXYL PALMITATE, TRIHYDROXYSTEARIN, SODIUM HYALURONATE, GLUCOMANNAN, GLYCERYL STEARATE, CETEARETH 20, CETEARETH 12, CETEARYL ALCOHOL, CETYL PALMITATEBORAGO OFFICINALIS SEED OIL, SESAMUM INDICUM SEED OIL, CETHYL ALCOHOL, PERSEA GRATISSIMA OIL, SODIUM CETEARYL SULFATE,BENZYL ALCOHOL, CAPRYLYL GLYCOL, BENZOIC ACID, PENTAERYTHRITYL TETRAISOSTEARATE, SILICA DIMETHYL SILYLATE, BUTYLENE GLYCOL, PENTYLENE GLYCOL, PARFUM, CITRONELLOL, HEXYL CINNAMAL, LIMONENE, LINALOOL, SODIUM HYDROXIDE, TOCOPHEROL, TETRASODIUM EDTA.